Once upon a time my Christmas day started with getting up as early as I thought I could get away with and seeing what was in the pillowslip on the end of my bed. I still have very clear memories of finding books and games in there. The books were my favourite presents. The pillowcase in question was this one. It was bought at a school fete I think, many many moons ago, it must be going on for 30 years old now, I still use it on my bed occasionally. 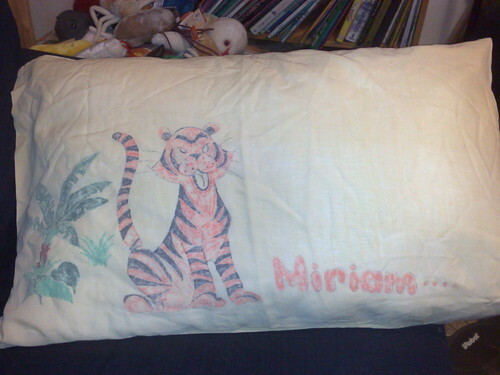 My tiger used to spend most of the year on my pillow but come December it was booted off in favour of the pillowcase made of Christmas fabric, I think mine had holly sprigs on it but I don’t seem to have that one, it must have stayed at my mum’s place. Once my sister and brother were awake, and it was no longer completely stupidly early, we’d haul our pillowslip sacks out to the loungeroom and see what had been left in the stockings (lollies mostly if I remember rightly). The when the whole family was awake it was time to open presents in our pjs, grab a quick breakfast, get dressed and head out to church. I loved going to the Christmas morning service, a lot of my best friends were there and we would exchange Christmas cards and compare Santa loot, it was a wonderful way to start a day of celebrations. Next up was either a dash home to prepare for the hordes of relatives who would be descending for Christmas lunch, or piling into the car to drive across Sydney to be horde-like ourselves. I can’t remember a Christmas Day in Australia as a kid that didn’t involve my cousins (we were in the US for 3 Christmases when I was growing up). We’d usually just got back from a week long beach camping holiday with our cousins a day or two before Christmas day too – I might write more about those holidays in a future post. I have no idea how my mother managed it, she must have been way more organised than I ever am. Even when I was heavily involved in youth fellowship and very consciously celebrating Christmas as being about the birth of Jesus it was still very much all about the connections with people, seeing my friends, giving to charity, finding a gift for someone that was just right, spending time with family. Our Christmas traditions were wonderful and I wanted Christmas to keep being wonderful in exactly the same way forever. Of course, that wasn’t possible, instead Christmas is now wonderful in ways that are sometimes very much like my childhood memories and sometimes in other new ways, and sometimes the things which I wish were still wonderful are not anymore and have had to be left behind and that’s hard. But then, we’ve been making our own traditions over the years and that’s pretty wonderful too.